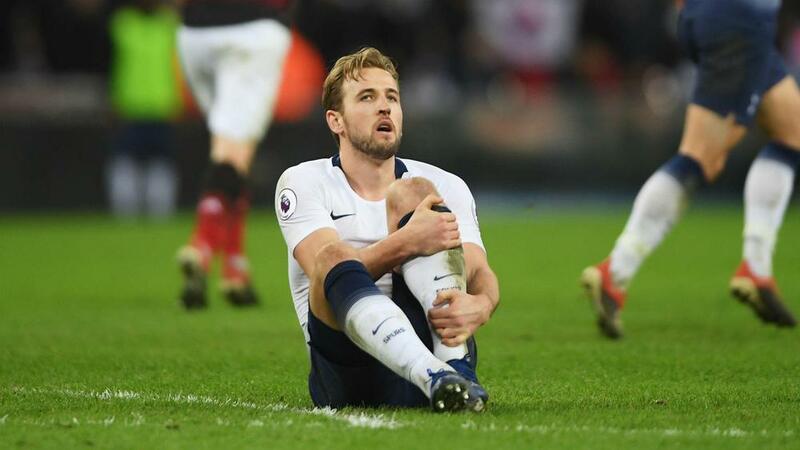 Tottenham coach Mauricio Pochettino is "worried" about the injury suffered by Harry Kane towards the end of Sunday's 1-0 defeat at home to Manchester United. The Spain international made 11 saves, including several to keep Kane out, as Spurs were frustrated. With the hosts piling the pressure on at the end, Kane came off worse in a heavy collision on the edge of the box, leaving him in a heap. He received medical attention after the full-time whistle, but appeared to be shaking his head and looked concerned as he was helped off the pitch. Pochettino believes the England striker twisted his ankle in the incident and is worried about the severity of the damage sustained, with Son Heung-min about to leave for Asian Cup duty with South Korea. "We are worried about that, we try to see tomorrow and we hope [it is not too bad]," Pochettino told BBC Sport. "I think it was in the last action, you can see on your cameras it was a clear foul. I don't remember who [was involved], but it was a big hit, a foul. "In that moment he twists his ankle. We hope it's not a big issue, but if it is, it is a big problem for us." Despite the defeat and frustration around Kane's injury, Pochettino came away from the match impressed with his team, lauding their second-half display as their best 45 minutes since he became coach. "I am so pleased and I'm proud," he added to Sky Sports. "After four and a half years, the second half was the best performance I have seen Tottenham play. "It was amazing and I think David de Gea made 11 saves, which is unbelievable. In football, sometimes you deserve to win and don't and other times, you do not [deserve to win] and you win. That is why we love football." The result left Spurs nine points adrift of leaders Liverpool but still with a seven-point gap to fifth-placed Arsenal in the race for Champions League qualification.